by Patrick J. O'Connor, Ph.D.
With more college options and higher college costs, students and parents need the advice and support of a well-informed school counselor to guide them through the college selection process. College Counseling for School Counselors gives counselors everything needed to build a successful college counseling program, no matter how many students they work with. After creating a framework for a strong curriculum, College Counseling for School Counselors shows how to explore all college options with students and families, including options for students with special needs and talents. The follow-up activities in each chapter give counselors resources that bring the ideas to life, and a three year calendar shows counselors how to introduce every idea at a manageable pace, building to a comprehensive college counseling program and strong individual college plans for every student. 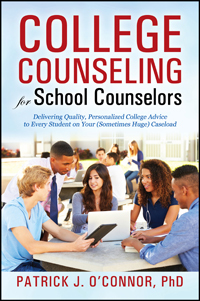 Busy, caring counselors will find everything they need in College Counseling for School Counselors to improve their college counseling program, and reach every student they work with.